From professional development programs to classroom practices…. We have all attended a professional development that was delivered by an individual with an impressive resume, research based practices claiming to improve student achievement, and a personality that can captivate the audience! The presenter stands on a stage or at a podium directing their audience’s attention to a screen displaying a presentation complete with statistics, colorful graphs and videos. Good presenters walk around, ask questions to encourage audience participation, and incorporate some type of interactive exercise. Slide after slide of information and data; the presenter focuses on the facts, the research, the theory behind the concept, and provides the audience with examples. This lecture style of teaching is customary in the professional learning industry, at conferences, and in classrooms across the world. In the case of the above example the presenter acts as the teacher and the educators act as the learners. Most school districts hire experienced presenters who know their content inside and out. 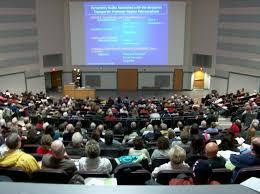 But lessons delivered by lectures can only hold the attention of learners for a limited amount of time. According to www.opencolleges.edu.au in an article entitled, “The Science of Attention”, psychologists claim the typical learner’s attention span is about 10 to 15 minutes long. Each learners’ mind begins to wander, causing them to lose focus and attention on the presentation. Once the mind begins to wander, is the learner learning the material? And what if some of those educators have things going on in their personal lives such as; a sick child, an ailing parent, a rocky marriage or they don’t feel well that day? Is it possible that after 10 minutes of a lecture style presentation educators may not have the focus to learn all of the material that is being presented that day? Consider this thought: Is it possible that this is a style of professional learning that is not effective? What if the presenter of the professional development approached her audience with the idea that during through the professional learning each member of the teaching staff would master the skills to implement this new knowledge into classroom practices the very next day? What if the provider of the professional learning led the learning opportunity with the idea that each person in the audience has a different background, different strengths/weaknesses and different students? What if the professional learning took into consideration each teacher’s teaching style and personality? What if each person in the audience learned exactly what they needed to be more effective in their own classroom? As school leaders it is our responsibility to provide our teaching staff with learning opportunities that enable them to do more than just listen and take notes from a presentation! In order to infuse a new concept into daily practices teachers need professional development that facilitates thinking, reflecting, writing, speaking and a process that is going to deliver the specific practices for their individual classrooms. Educators need professional development that not only equips them with the practices to implement new knowledge in their classroom, but also the confidence to tweak it to fit the dynamics of their class or an individual student. In order to become a more effective teacher, teachers need ongoing support to guide them in how to incorporate new theories and ideas into their existing curriculum or classroom practices. The concept of providing teachers a professional learning opportunity that provides practical application for her classroom does not mean providing handouts and take aways with the idea that the teacher will reference the handouts once she gets back to her classroom! Educators need a professional learning opportunity where teachers are offered resource learning, experiential learning and service learning. Effective professional learning opportunities allow each attendee to envision exactly what practices she will implement in her classroom and how she will tweak those practices based on the needs of her learners. At Generation Text Online teachers have an opportunity to share what their students are like and HOW they learn. Through journal writing exercises each teacher has an opportunity to reflect on each individual learner and how the Gen Text practices will enhance learning opportunities. Our professional learning provides an opportunity to discuss how each teacher might tweak our practices based on her students and the community she teaches in. During the Gen Text professional learning teachers learn routines and practices that are designed to be infused into daily teaching and learning with an objective of building specific interpersonal skills. These skills are practiced through weekly routines and 21st Century learning activities in order to build a strong foundation. At Gen Text our belief is that all professional learning must be personalized. Our PD model demonstrates how to take into consideration the individual student who has different strengths and different needs than each of their classmates. Our professional learning provides teachers with ongoing support and practice in understanding exactly how they can use these theories and ideas in their classrooms to be a more effective teacher. This learning experience focuses on how to facilitate each lesson and what to do if a class discussion veers off into a subject area that the teacher is not prepared for. Teachers are provided with guidance on how to deliver the lesson when students don’t react the way it was explained in the training they attended. There is an art to delivering professional development that allows each teacher to immediately incorporate their new knowledge and practices in their 21st Century Learning Environments and Generation Text Online understands just how to do that!